Census data released today by Statistics Canada has revealed that Surrey’s population has surpassed 500,000. As of May 2016 last year, the population of Surrey was 517,887, an increase from 468,251 in 2011 representing a growth rate of 10.6%, outpacing the national average, British Columbia, the City of Vancouver, and the Vancouver CMA. The only Vancouver CMA municipality to grow faster than Surrey was the Township of Langley which grew at a rapid 12.6%. As a whole, the Vancouver CMA grew to 2,463,431. With Surrey adding an average of 1,000 new residents per month, as of February 2017, the population of Surrey can be estimated to have already increased further to 525,000. It is expected that Surrey will surpass Vancouver in population to become the largest city in BC by 2030. 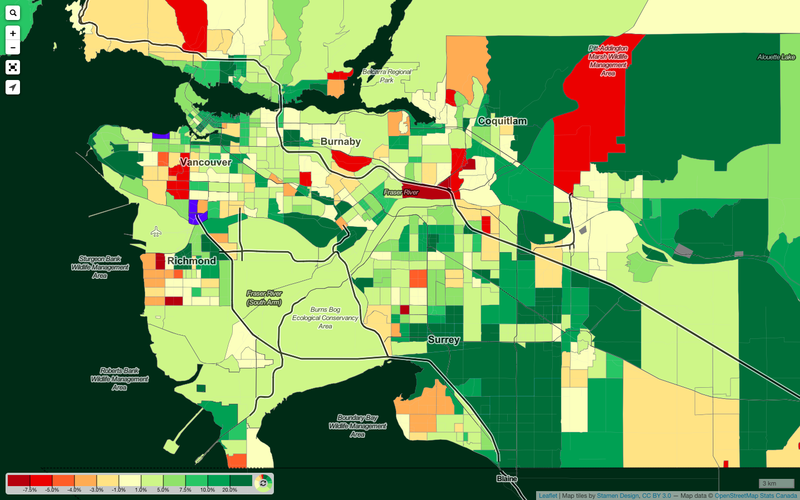 Looking at growth by Census Tract, the areas of Surrey growing the fastest were in the south and east, in places such as Grandview Heights, Sunnyside Heights, South Newton, and Clayton. There was also noticeably strong growth in Surrey City Centre as a result of new condo developments in recent years, with one Census Tract east of King George Blvd and south of 104th Avenue growing by 33%. This growth in City Centre will likely increase even more by the 2021 Census, with more new condo developments expected to be completed within City Centre in the next 5 years than in the previous 5 years. Developable land and affordability in comparison to Vancouver can both be seen as driving factors in Surrey’s strong growth. 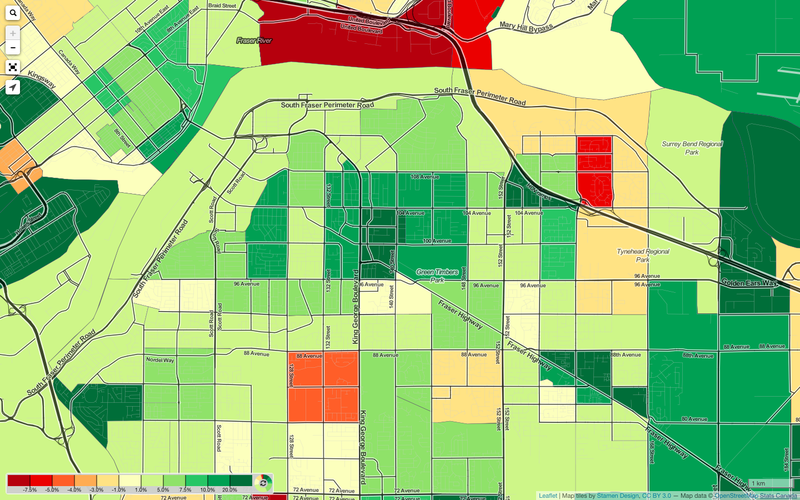 Growth rate by Census Tract in North Surrey – Area east of King George Blvd and south of 104th Ave grew by 33%. Looking at growth in absolute numbers. Surrey outpaced every municipality within Metro Vancouver by a large margin, adding a total of 49,636 residents between 2011 and 2016. Vancouver came in second adding 27,984 new residents.